TWO Winners Will Receive TWO $7 Wendy's Giftcards!!! I am giving away TWO $7 Wendy's giftcards to TWO winners in honor of their new "Pick 2" menu! Mandatory Entry: What pick 2 combo would you choose? This contest is open until Sunday November 7 at midnight. I must have a valid way to reach you, so leave me your email address in your comment OR be sure your profile has your email address visible. No duplicate comments will count. This giveaway is open to US residents age 18 and older. Winners will be selected via random.org and must respond within 48 hours of being notified by me or I will select a new winner. Wendy's New "Pick 2" Menu!!! Today some friends and I tried Wendy's new "Pick 2" menu and it was DEE-licous! I've always been a fan of their chili and now I can have that AND one of the seven other "Pick 2" menu items for the low price of $4.99. I know! What a deal! 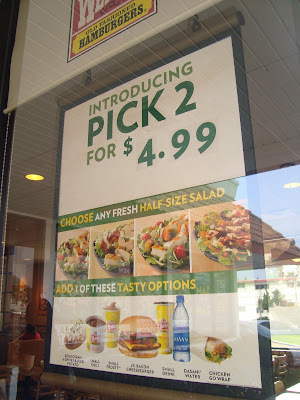 Wendy's recently launched their new "Pick 2" menu which offers a half-sized version of their four Garden Sensations salads along with their ever so populare chili, Junior Bacon Cheesburger, baked potato, Chicken Go Wraps, a small beverage, Dasani bottled water or a small cool and creamy Frosty. I loved the fact that eighteen of the possible twenty-eight combinations avaiable are less than 600 calories (without dressing), and all of them combine fruits, vegetables, nuts, dairy and proteins. I loved the fact they had the nutritional value information right by the counter! When it came time to order I decided on the chili and their new Apple Pecan Chicken half-sized salad. The nuts and blue cheese mixed with the Pomegranate Vinaigrette was a great combination of flavor. My friends tried the BLT Cobb Salad and the Spicy Chicken Caesar Salad which both got the thumbs up. We all commented on what a perfect size the salads were and couldn't believe it was a "half" portion. My daughter enjoying some fries with a gallon of ketchup. My daughter and best friend as my "Pick 2" samplers. During lunch I learned that Wendy's is one of the few fast-food chains that makes their burgers fresh to order and made with never frozen North American Beef. Fellow mom blogger Amy also informed us that Wendy's creator Dave Thomas who was an adoptee himself started the Dave Thomas Foundation for Adoption whose ambitious goal is to match every foster child with a permanent home and loving family. 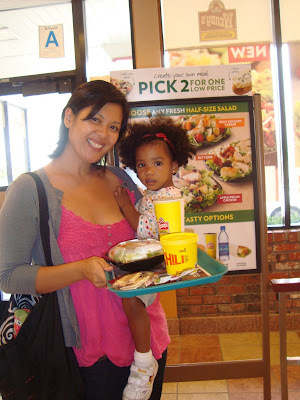 Myself, my daughter, and fellow mom bloggers Marsha and Amy enjoying our Wendy's lunch. If you love real taste made with fresh ingredients and also appreciate value make sure to stop by your neighborhood Wendy's and "Pick 2" for under $5!!! Disclaimer: I was paid a $150 stipend by Wendy's and TheMotherhood.com for participating in the trial of Wendy's new "Pick 2" menu. The views and opinions expressed in this post are my personal and honest opinion. Mickey's Halloween Party at Disneyland!!! "Wow! I get to go to Disneyland!" These were my exact words when my mom told me the family was moving from the Philippines to the United States of America. I was only 9 years old then but boy was I excited. So excited that when we finally arrived in the U.S. I thought a miniature golf course (with a castle and windmill) on the side of the highway was Disneyland. I told my mom, “It doesn't look very big." You can imagine how shocked I was when I finally went to the real Disneyland. It was definitely bigger than a miniature golf course. Since then I've only been back a handful of times but this past weekend I was lucky enough to bring my daughter and husband to share in the Disneyland experience. This trip was even more special because it was Mickey's Halloween Party and also a first for both father and daughter. I loved the fact that most of the people standing in line for the event, my daughter included, were wearing costumes. She dressed up as Snow White even though I knew she would've rather dressed up as her favorite Disney character Minnie Mouse. Me as Where's Waldo (without the hat) and my daughter as Snow White. When we first entered the park we took photos with Pluto, Donald Duck and my daughter's favorite Minnie Mouse. They were dressed in Halloween costumes which made the photos extra-special. My daughter's face lit up when she spotted Minnie Mouse in her purple and orange Halloween dress and hat. She smiled from ear to ear as Minnie knelt down to pose next to her. The joy on her face alone was worth the trip. Michael, Me, Isabella, Pluto, my niece Elizabeth and my sister Gerry. Donald Duck with daddy and Izzy. The happiest girl in the happiest place on earth. Our next stop was The Pirates of the Caribbean. We rode with two toddlers and in hindsight I think they could've waited a few more years before this ride. The talking skeletons and firing canons were probably a little more than they could handle at that age. I hadn't seen it in about 15 years so I noticed a lot of improvements especially the addition of Jack Sparrow. Giant pumpkin on Main St.
After that traumatic experience, we decided to leave the kids with my friend's nanny so the grown-ups could go through the Haunted Mansion. (I guess we learned from the "Pirates" experience). The inside was decked out with spooky decorations from the classic movie, "The Nightmare Before Christmas". We worked up an appetite from all the walking and riding so we decided to stop by the Hungry Bear for some burgers and fries. But we took a slight detour to trick-or-treat at numerous stands that had candy and healthy treats available for all the guests. The candy they were giving away were what you would call the "good" candy. I mean Kit Kat, Snickers, M & M's and even apple slices and baby carrots for the health conscious trick or treaters. We then took a relaxing train ride around the park and got a chance to see all the Halloween decorations in Tomorrowland, Main St. and New Orleans. The ride brought back so many memories for me. I felt just as excited as I did when I was nine years-old. Me, Isabella, Aubrey and Amy. Our view of Toon Town on the train ride. Before you knew it, it was time for the fireworks spectacular "Halloween Screams-A Villainous Surprise in the Skies". I have seen lots of fireworks in my day and I have to say this one was the best. After more trick-or-treating (because a pound of candy simply isn't enough) we headed toward Tomorrowland. My daughter fell asleep in my arms while daddy rode Captain EO and Space Mountain. His face in this souvenir photo says it all. Once her power nap was over my daughter insisted on ending the night with a game of skiball at the arcade. We danced our way out to some party music that played in Tomorrowland while picking up more candy on our way out. If you haven't been to Mickey's Halloween Party at Disneyland be sure to check it out before October 31st. You'll leave with memories that will last a lifetime! The traditional family photo in front of the grass Mickey in the main entrance. Thank you to Disneyland for making our first family trip to "the happiest place on earth" such a memorable one! It definitely will not be our last. Disclaimer: I was not paid for this post. I was given tickets to attend the event and the views expressed are my personal and honest opinion. Cat Cora and the Muppets Cook Up Some Yummy Treats Along With Some Laughs! My two year old and I have started taking turns on the computer. She'll watch youtube videos of her favorite shows and when she's done I'll check email or look for recipe ideas. 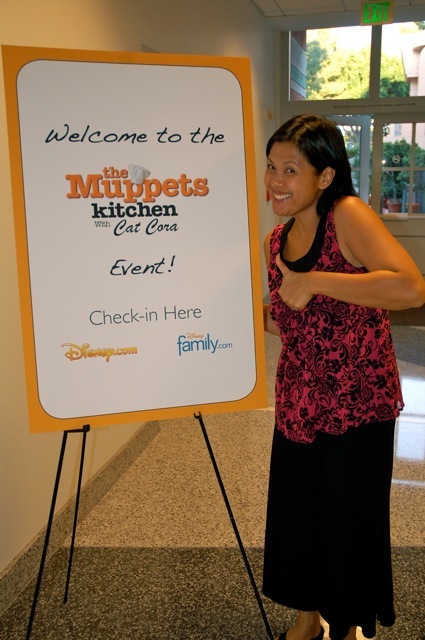 Now with The Muppets Kitchen with Cat Cora we've finally found something we can both enjoy at the same time. Last week, we attended a live demonstration of this entertaining and educational new web series starring my food network idol, Cat Cora, along with Chef Angelo and Pepe the King Prawn. Cat prepared a delicious popcorn trail mix that was both healthy and tasty. Chef Angelo and Pepe the King Prawn were witty and charming and kept the whole audience laughing throughout the cooking segment. Pepe even gave every audience member a red rose in the vein of the Oprah giveaways. 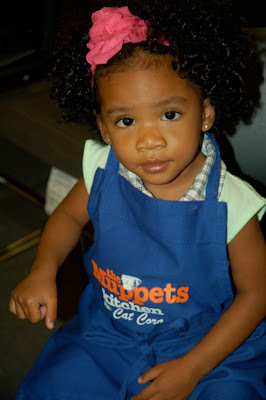 Cat gave us great tips such as involving our children in the preparation process so they can be more interested in the food they are eating. Cat and the muppets in action. My rose from Pepe the Prawn. 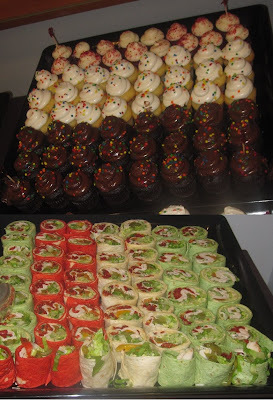 After the cooking show we got to sample some Mediterranean pinwheel hummus wraps, mini red velvet cupcakes and the delicious Trail Mix popcorn Cat prepared. 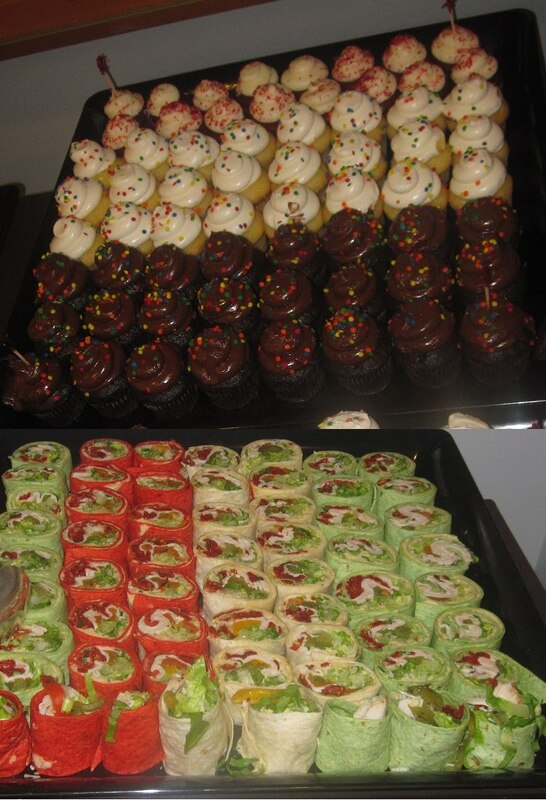 Cupcakes galore and colorful hummus pinwheel wraps. DEE-lish! She was also kind enough to sign a copy of her cookbook Cat's Classics With A Twist and pose for photographs. I tried not to act too star struck since she is the only female Iron Chef and a food network star. Did I mention I was a HUGE fan of hers?! 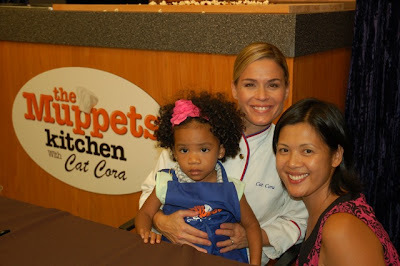 The stunning Cat Cora, my little Isabella and me. We watched episodes of the web series while waiting for our turn to meet her. One of my favorites was "The Really Cheesy" episode which showed how to make a simple and quick cheese sauce. One of the great things about the segment was it was only around three minutes long. Another feature of this site was the Hasty Tasty Cooking Tips which provides all the recipes that Cat prepared. I think the most memorable part of this whole experience was the look on my daughter's face while she watched the muppets. She sat in complete silence with her eyes wide open the whole time. She proudly wore a Muppets Kitchen with Cat Cora apron while eating more than her fair share of cupcakes. Pretty sure that's cupcake #3...or 4. 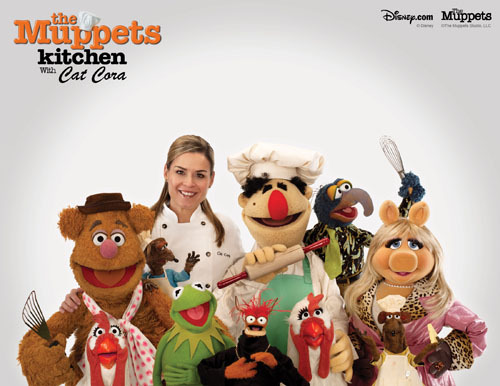 One thing's for sure The Muppets Kitchen with Cat Cora is already a favorite in my house. Thank you to Disney for allowing us to share in such a memorable experience. Disclosure: I was not paid for this post. I was invited to the event and the views and opinions expressed are my personal and honest opinion.